If you are still coming up empty when you use SoulCards, ask yourself this, “What am I trying to protect or avoid around this issue?” Then draw another card. Odds are, this will get you closer to the core issue than your original inquiry. Here are ways to work more deeply with the cards, plus ideas on using them with others. This information is from the SoulCards Manual. Take a moment to quiet your mind so that you can hear the voice of your soul. Select a time and space that is free of distractions. Sit comfortably, feeling the length of your spine. Bring your attention to your breathing. When you feel a sense of stillness and openness, ask for support from the highest source within for your experience with the cards. With SOULCARDS in your hands, take some time to become clear about your intent. It may be helpful to write down some thoughts on the subject you want to explore. Do your best to get in touch with the core issue. For example, if you are trying to decide whether to move to a new home, you might list qualities that make you feel at home. This may help you realize that there are other reasons that you are not at home in your life. When you feel as deeply in touch with your issue as possible, formulate a simple question or statement. The closer you are to the core of the matter, the deeper your session with the cards will be. There are two fundamental ways to select your cards, face up or face down. In REFLECTION, the cards are face up and you choose while viewing the images. In DIVINATION, the cards are face down and you choose while seeing only the backs of the cards. Each approach has its own gift. Look through the images on the cards. Try not to think about their meaning. Select one or a few cards that most capture your attention. Consider those cards which repel you to be as significant and worthy of your attention as those which attract you. Place them face up on a flat surface. Move them around in relation to one another until you get a feeling of “rightness” in their positioning. As you INTEGRATE THE IMAGES, try identifying any themes and patterns of inter-relationship among them. How does all of this apply to the issues you are exploring? Turn the cards face down and shuffle the deck as you hold a chosen issue or question in your mind. Keeping them face down, spread the cards out and gaze at the patterns formed by the texture on the backs. It may be helpful to move your hand over the deck. Select one or several cards, as you are drawn to them. It is helpful to have a pre-determined structure, traditionally called a SPREAD, to organize intuitively selected cards. By focusing the range of inquiry, spreads offer greater access to personal insight. Books on Tarot offer numerous additional spreads that can be explored. Another dimension can be added to your experience through combining the methods of card selection. In exploring a particular life issue or question, begin by looking through the cards. Choose one or more that you respond to through REFLECTION. You may like to select cards that express each position on a predetermined spread. These will represent your conscious awareness. Next, shuffle the cards and choose through DIVINATION for each position on the same spread. These represent messages from a ‘knowing’ beyond your conscious awareness. Explore the relationship between the sets of images arising from these two layers of your consciousness. After you have selected your cards, choose one or several of the following ways to explore their significance with respect to the question or issue you are exploring. Bring your attention to one of your chosen cards. Become aware of the shapes, textures and colors in the image without thinking about its meaning. Imagine you are looking at a photograph of a living being. Can you sense its presence? Notice any feelings or thoughts that arise as you are gazing at it. When you come to a sense of completion with one card, go on to another. If you are particularly intrigued or inspired by one card, find a place in your home or office where you can display it such that its presence can be felt in your life. Over time, notice which images remain in your mind’s eye. In what way and at what times do you see or feel these images? How does your experience of the images relate to the issue or question you are exploring? Gaze at a chosen card. Describe the shapes, colors and textures. What is the figure doing, feeling, or knowing? How does this image affect you? Does a title come to mind? Can you describe the image in poetic terms? If you would like to enter a story telling mode, begin with “Once upon a time” and allow a story to unfold. If you have chosen several cards, imagine that the figure in each one is a character in the story. You can also allow an image to speak for itself. Imagine that you are facing a living being. Ask it to describe itself and speak its wisdom. Does it have a question for you? What challenge does it offer? What gift does it bring? Allow it to speak in the first person. If you have selected several cards, allow the images in them to speak to one another. After engaging in some of the processes suggested here, reflect upon how the experiences you had working with the imagery may relate to your chosen issue or question. 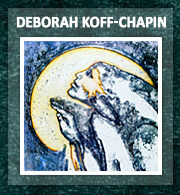 Begin with silent contemplation of a chosen card. Close your eyes and see how clearly you can see it in your mind’s eye. Imagine that it is alive. Allow the inner image to begin to change. Try not to control or judge what comes. Just notice the feelings your new image evokes. If it continues transforming, stay with it until you arrive at a sense of stability or completion. If you want to explore the relationship between two or more images, lay them out and gaze at them simultaneously for a while. Then close your eyes and visualize them. Allow these interior images to interact and effect one another. Stay with the visualization until you feel a sense of resolution. Do the new images provide fresh insight or offer new possibilities? You may like to manifest your interior images through drawing, painting, collage or photography. 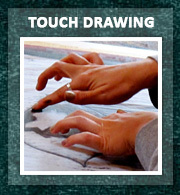 For information on Touch Drawing, the simple yet powerful process used to create the images in this deck, see Supplemental Resources. After CONTEMPLATING an image for a while, close your eyes. Imagine that you are the figure in the card. Let your body begin to experience the atmosphere, colors, sounds, and muscular sensations of this figure. If you are comfortable doing so, assume the position of this figure with your own body. How does this feel? You may take this process further by beginning to move. Carefully selected recorded music can be supportive. Your movements may be very subtle at first. As you become more comfortable, they may become bolder and more expressive. Let the movements change organically as you stay true to the expression of the moment. Be aware of the feelings and thoughts that arise. When you feel complete, come to stillness. Notice the sensations in your body. In what ways do you feel different now? Look at the card again. Do you have any new insights or perceptions? Bring a glass of water with you to bed. After taking a few moments to quiet your mind, get in touch with the issue you would like to bring into your dreams. Gaze deeply at your chosen card, opening to the possibility of its influence on your dream life. Hold the image in your minds eye. As you drink half the glass of water, affirm that you will remember your dreams. You may put your chosen card under your pillow while you sleep. When you awaken in the morning, drink the rest of the water with the intention of remembering your dreams. Gaze at the image on the card again. Record your dreams in a journal. Take note of any connections between the image, your dreams, and the issue that you are working with. Establish a space in which you feel safe to explore and create sounds. If you have one or more instruments, place yourself in a position to use them. Visually contemplate a chosen card. As you gaze at it, listen to the sounds of the environment about you. After a moment, allow your awareness to include the sounds of your body (heartbeat, fluids) and eventually the sounds of your soul. It may help to close your eyes. Let your body create the sounds it desires. It may use your voice, your hands or legs, whatever available-your body knows. If you are using an instrument, allow it to become an extension of your body. You may begin to feel like you are being “sounded, sung, or played”. Remember to keep listening. Using the cards with another person can bring greater focus to your experience as well as open new channels of communication between you. You and someone you are close to can offer mutual support through witnessing each other’s experience with the cards, and sharing insights. With help from your partner, discuss and clarify the subject and intent of your session. Choose cards through REFLECTION and/or DIVINATION. After a time of SILENT CONTEMPLATION, speak to how the chosen images relate to your intention, or tell your story through these images. Remember, any other mode of processing can be used as well. Invite your partner to share his or her perceptions and insights. If you want to explore your relationship issues or a question you are addressing together, spend some time becoming clear on your shared intention. Through REFLECTION, and/or DIVINATION each of you select some cards and lay them out in their own pattern or SPREAD. Give each other time to process privately through SILENT CONTEMPLATION, VISUALIZATION, journal writing or any other mode before sharing with each other. How do these images relate to the unique perspective each of you now brings to this shared issue? After exploring the individual sets of images, try combining them into a single pattern or SPREAD. How do the images effect one another when combined? What are their relationships? Do they tell a new story? You may also like to choose another card to represent your combined energies. How does this image relate to the ones chosen as individuals? Does it offer some kind of resolution or integration? As a therapist, have your client select some cards through REFLECTION. Process them in any of the ways suggested here, or using your usual therapeutic techniques. 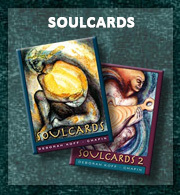 If you are working with a therapist, you may like to bring SOULCARDS (or a few selected cards) to your session to use as catalysts for your process. Have your client choose some cards through DIVINATION. Use the cards as windows to your intuitive knowledge. Be open to receive the insights of your client on his/her situation as well! These cards tend to evoke a direct response. These images can touch the ageless soul of a child. Use any of the processes suggested in this manual to draw out the creativity and wisdom in a child. Story telling can be particularly appropriate with children. As a group, get in touch with the core issue you want to explore and formulate a statement or question. Pass the deck around, allowing each of you to choose one image through REFLECTION. 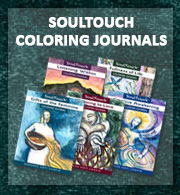 Allow time for SILENT CONTEMPLATION, journal writing or VISUALIZATION. Then each of you may share in whatever way you choose. You may read from your journal, speak in the first person as if you are the being in the card, communicate non verbally through movement, etc. What perspective does each of you have to offer the whole? When everyone has communicated about his or her card, lay the selected cards out before the group. Move them around while you explore the inter-relationships between the images with respect to the chosen issue. After clarifying a question together, decide whether you will select a single card, or chose an appropriate spread. In silent attunement, ask for the most appropriate images) to be chosen through DIVINATION. Pass the cards around the group, and allow each person to shuffle the deck. Have a member of the group choose the cards and lay them in the spread. Using any of the previously described ways of INTEGRATING THE IMAGES, each of you share your own unique perspective on the chosen cards and how it applies to the group issue. Another approach to selecting the cards could be to spread them out face down in the center of the group. Allow each person to select a single card. After some private time to INTEGRATE THE IMAGES in your own way, each of you share your gifts of wisdom and creativity with the group. NOTE: In both GROUP REFLECTION and DIVINATION, new possibilities are made available if each member has his or her own deck. Most noteworthy is the opportunity for the same image to occur in more than one person’s selections.